Exposure to the very high levels of air pollution found in developing megacities like Beijing and Delhi pose a serious and immediate risk to population health, leading to reductions in life expectancy for millions of people. The Atmospheric Pollution & Human Health (APHH) in Developing Megacities Programme funded by UKRI and The Newton Fund aims to studies air pollution in Beijing (APHH-China), where it is jointly funded by the The National Science Foundation of China (NSFC), and Delhi (APHH-India), with matching funds from the Ministry of Earth Sciences (MOES). The programme aims to identify the concentrations and sources of urban air pollution in Beijing and Delhi, understand the chemical processes and identify how people are exposed, to understand how it affects their health, and to determine what can be done about it. This programme brings together leading Universities and Research Institutes from the UK, China and India, promoting the bi-lateral exchange of knowledge and data in order to affect meaningful change in our understanding and management of air quality issues in large urban conurbations. More information on the wider can be found at the programme websites for APHH-China and APHH-India. The Biosphere-Atmosphere Exchange & Effects Group of the Atmospheric Chemistry and Effects Science Area at CEH are taking a lead in quantifying the mix of pollutants directly emitted from Beijing and Delhi in a concerted effort to identify the key sources of air pollution and their controls. Using state-of-the art analytical instrumentation our group is in the process of validating existing emission inventories for a wide range of pollutants. This exercise is critical as inventories of pollutant emissions to air form the basis for model predictions of air quality, visibility, human exposure, human health impacts, and climate change. They are further required to understand relationships between individual source locations or source types and targets. None of the model predictions and analyses can be better than the emission database on which they are founded. In China, Dr Eiko Nemitz and his team have been measuring the emission rates of a range of pollutant fluxes from central Beijing as part of the APHH programme. Working from the 325 m tall radio mast operated by the Insititute for Atmospheric Physic of teh Chinese Academy of Sciences the team have directly measured how much particulate matter the city emits as well as other important pollutant gases including ozone, ammonia and a wide range of volatile organic compounds. The major focus of their work has been on identifying the key sources of particulate matter to the atmosphere as tiny particles can penetrate deep into the lung and have been linked to both heart and lung disese. PM also effects visibility and below you can see two pictures of our sampling equipment on the tower. When PM loadings are below the World Health Organisation limit values of 25 µg m-3, the mountains are just visable on the horizon. However, during major pollution events when PM concentrations reach a staggering 350 µg m-3 visibility is dramatically reduced. As well as spoiling the view, these pollution episodes cause major disruption on the roads and in the skies, with aircraft approaching Beijing often diverted. A sonic anemometer was mounted on the tower at a height of 102 m to measure the fluctuations in the vertical wind velocity which drives the transport of pollutants away from the surface. On the ground, the team used a High Resolution Aerosol Mass Spectrometer (HR-AMS) to measure the concentration and chemical speciation of fine particulate matter and a Proton Transfer Reaction - Time-of-Flight (PTR-TOF) to measure the wide range of reactive organic compounds in the atmosphere. Combining rapid measurements of pollutant concentrations (10 Hz) and the vertical wind velocity allows Nemitz and Colleagues to calculate the rate at which pollutants are emitted (e.g. mass of pollutant per m2 per second) from the city below in a process known as eddy covariance. Further instrumentation was housed on the tower itself which included a Quantum Cascade Laser (QCL) for the measurement of ammonia (NH3), Ultra High Sensitivity Aerosol Spectrometer (UHSAS) for the size resolved measurement of particle number, a Rapid Ozone Flux Instrument (ROFI) and an open path CO2 analyser. DelhiFlux is a project led by BAEE Group Leader Dr Eiko Nemitz and aims to provide a step change in the quality, detail, scope of and confidence into the emissions inventory of atmospheric pollutants for the New Delhi area. To improve the emission factor database for key source types and compounds in Delhi through a combination of lab and field based emission factor measurements, using harmonised instrumentation. To compile a state-of-the-art emission inventory for the greater Delhi area at a spatial resolution of (1.6 km)2, together with temporal profiles of the diurnal and seasonal variability. To inform and evaluate this emission inventory through direct and independent emission flux measurements at the urban scale (~10 km2). To apply atmospheric transport modelling to assess the performance of the emission inventory against concentration measurements and quantify the implications of the emissions improvements for air quality indicators. As part of the DelhiFlux project the team have constructed a rooftop mast and a 30 m tall flux tower from which to directly measure pollutant emissions from two contrasting regions of Delhi. The core measurement site is located at the Indria Gandhi Delhi Technical University for Women (IGDTUW) which is situated on the periphery of Old Delhi and overlooks a very heavily populated area. The secondary site is located within the grounds of the Indian Meteorological Department (IMD) of the Indian Ministry of Earth Sciences (MoES), with the surrounding flux footprint covering institutional buildings, a major road and green spaces. Our measurements at these sites will inform the development of a new emission inventory for Delhi that will be compiled at a 1.6 km x 1.6 km resolution with diurnal and seasonal temporal profiles. It will cover NOx, SOx, NH3, total volatile compounds with breakdown into its chemical profile, particulate matter in fine (PM2.5) and coarse (PM10) size ranges, together with the toxic metal components within, as well as CO2 and CO as combustion tracers. 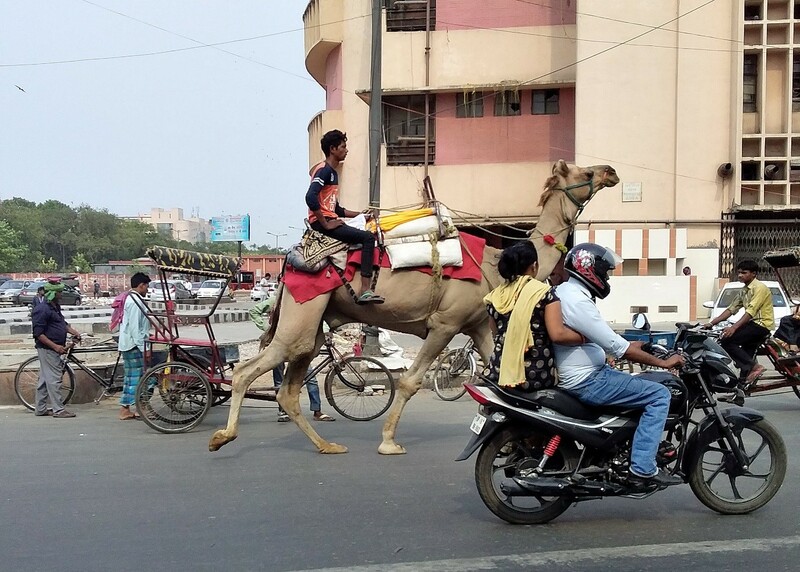 "The vehicle fleet we see in Delhi is quite unlike anything we have encountered before ..."
To further improve the emission inventory the team are working with Dr Tuhin Mandal at NPL India to make laboratory-based measurements of emission factors for a range of fuel types. In addition, for the first time in India, the emissions from individual vehicles under real-world driving conditions will be measured by colleagues at the University of York to characterize the on-road emissions of the actual Delhi vehicle fleet. These activities will provide further information on potentially missing sources and serve as a direct assessment of the quality of the emissions inventory. Further, state-of-the-art chemistry and transport models are being applied by members of the project to infer the concentrations that would be expected on the basis of the new emissions inventory for comparison against concentration data from air quality networks and the wider NERC-MRC-MoES-DBT programme. The project aims to improve the emissions data required to assess human exposure, to quantify the economic impact of air pollution in Delhi and to develop cost-effective solutions to combat air pollution in Delhi. Accurate knowledge of emissions is a key factor underpinning the development of mitigation strategies which will deliver improved public health, whilst further allowing economic growth. Both the UK and Indian research teams will benefit from their interaction and exploitation of complementary expertise. The project will leave a legacy beyond the project lifetime by increasing the research capacity of the Indian teams and providing the knowledge base which will allow the findings to be extrapolated to the rest of India. Thus, it is anticipated that the project findings will continue to contribute to the improvement of life and welfare of more than a billion people.